The Kelowna Rockets have acquired 2000-born forward Michael Farren from the Saskatoon Blades in exchange for a third round pick in the 2020 WHL Bantam Draft. The Richmond, BC. native is right-handed centre born on April 19th, 2000. The skilled forward is 5'10 and weighs 165lbs. 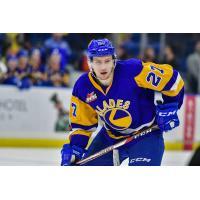 So far in his WHL career Farren has accumulated 20 goals and 37 assists for 57 points in 133 games all with the Saskatoon Blades, including five points in eight games so far this season. Prior to playing for the Blades, Farren tore up the BCMML with the Valley West Hawks scoring 15 goals and 33 assists for 48 points in 40 games in the 2015-2016 season. "He's a skilled guy who we are hoping can come in and put up some good offensive numbers," said Rockets Assistant General Manager Lorne Frey. "He's a younger guy, hopefully a two-to-three year guy, and we think he can help us move ahead offensively. We're trying to get more offence injected into the team and were hoping that he can help as he's a young, talented kid. We're looking ahead to the future." The Rockets sent a third round selection in the 2020 WHL Bantam Draft back to Saskatoon in exchange for Farren. The Rockets are back in action tomorrow night when they visit the Tri-City Americans in Kennewick, WA. at the Toyota Center. Michael Farren is expected to make his Rockets debut on Saturday night at Prospera Place when Kelowna and Tri-City go head-to-head in a rematch of Friday night. Puck drop on Saturday is at 7:05pm. For season ticket info contact us by email - Gavin Hamilton - gavinh@kelownarockets.com or Andrew Deans - andrewd@kelownarockets.com, or by phone at 250-860-7825.